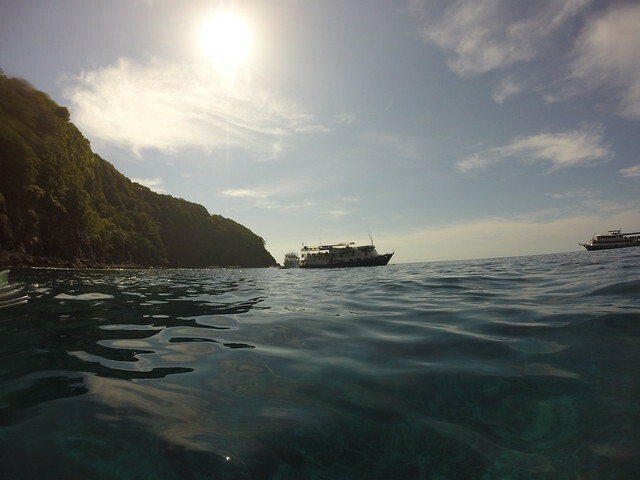 Diving the Similan Islands….on a boat! If you love the water, being on a boat, and an opportunity for lots of diving, a live aboard trip makes a lot of sense. That’s exactly why we did it. After our 6 nights in Phuket we headed up north an hour and half to Khao Lak to depart for our three night live aboard adventure to the Similan Islands. 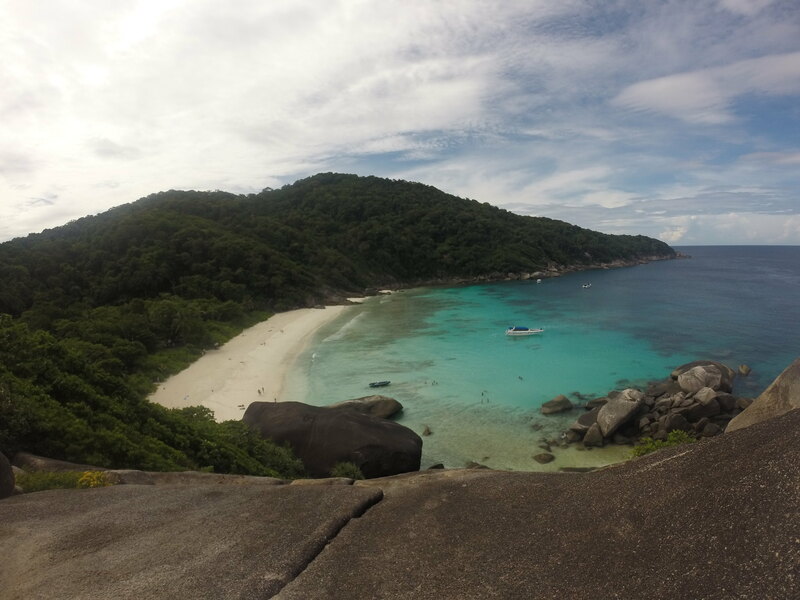 Where and what are the Similan Islands? The Similan Islands are a set of 9 islands (technically 11 today) located 70 KM off the mainland of Thailand that make up the Similan National park. They are home to the best dive spots in Thailand. The islands were impacted by the 2004 Tsunami but are slowing recovering. 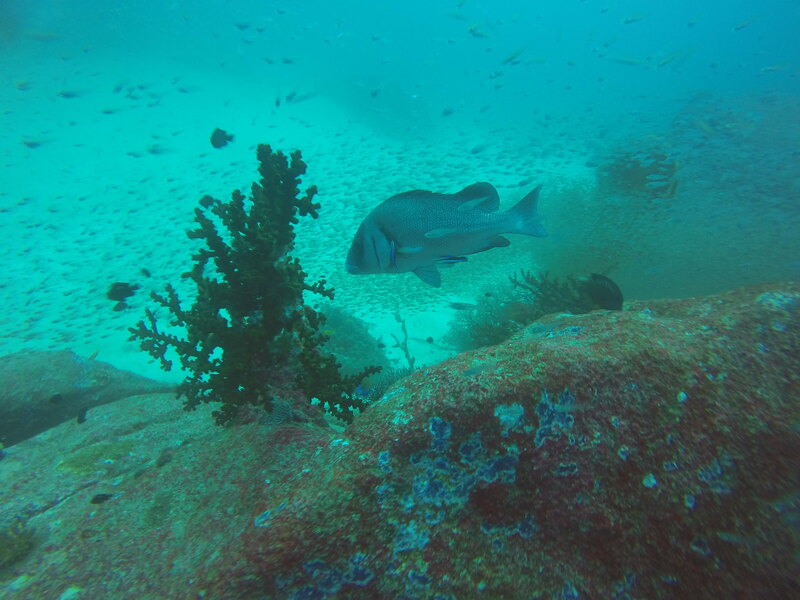 The National Park helps to protect the islands and closes them during low season to divers. In addition, only certain spots are open to divers so the damaged areas have time to regrow. But, it only does so much. Coral bleaching occurs often with the rising ocean temperatures. 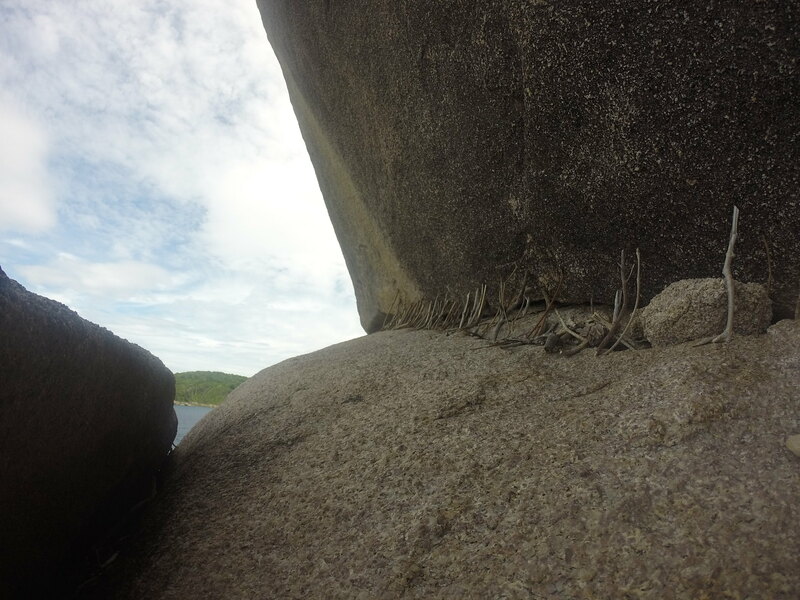 Dynamite fishing tactics used by locals also cause great damage. We learned on our boat that when the islands are closed to diving for 6 months of the year, they open it to the fisherman (under the table of course) because they pay the money to have access to fish on the reefs. The dive boats will see the fishing boats out occasionally where they are not supposed to be but can’t say anything because the national park will take away their dive license. Tough spot to be in and unfortunately is going to impact both sides in the long term when there are no fish to go see, or hunt. On a brighter note, the islands are beautiful- above and below sea level. The color and clarity of the water is what you see in Conde Naste magazines. On land, you can find stunning beaches made of pure and soft white sand surrounded by giant boulders. Under water there is a ton to see. ..but you should have an idea of what you are looking for because some species are so small you will miss them! Here’s the map to give you an idea of where we went. 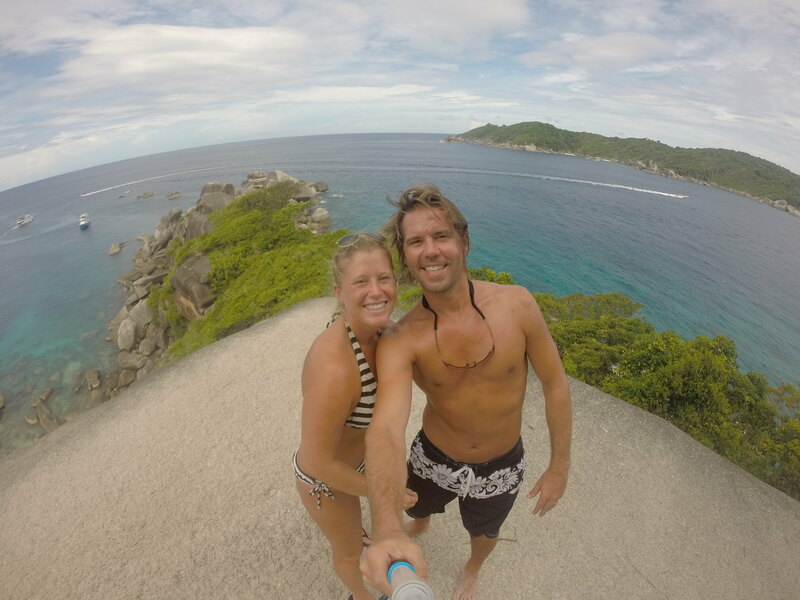 At the top of Koh Similan island in Donald Duck Bay. Impressive boulders and amazing water color make this view pretty special. Oh don’t worry, it’s safe because these sticks are holding the massive boulder up. Sounds intense, right? Well it sort of is, but that’s the point of a liveaboard. You are there to do one thing and that is dive. 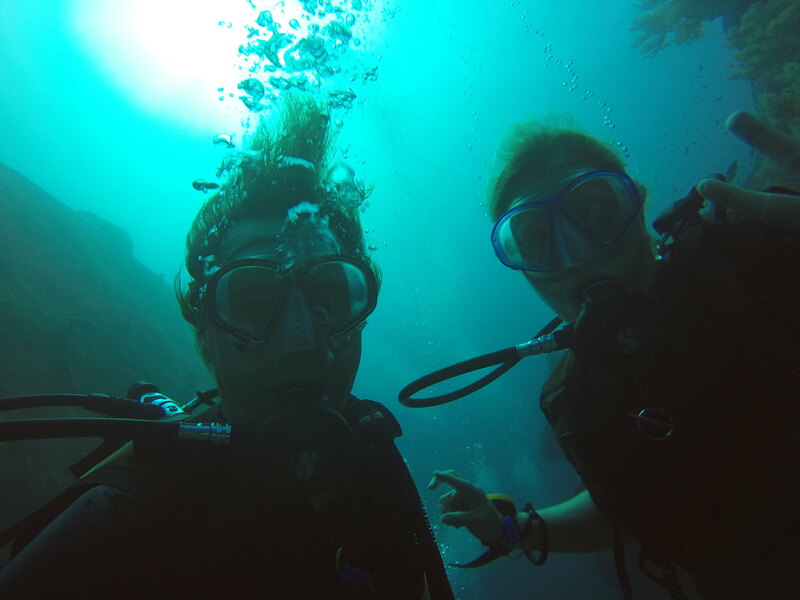 While Jeff and I are not your typical “dive enthusiasts” we like the idea of being with a group of people who are interested in the same goals as us- see some cool stuff and have fun! Another advantage of a liveaboard is that you don’t spend a good chunk of your day in tranport to the dive sites as you do with day trips. Here you wake up, have some tea or coffee, watch the sunrise, and get ready to start your day with a dive around 7:30 am. The morning dives are my favorite. Is there a better way to start your day? Plus, it’s usually breakfast for the fish so they are actively swimming around and hunting. After the first dive, we have breakfast, relax, then prepare for dive #2 around 11 am. I am sure you can guess what is next…eat lunch, relax, dive again. 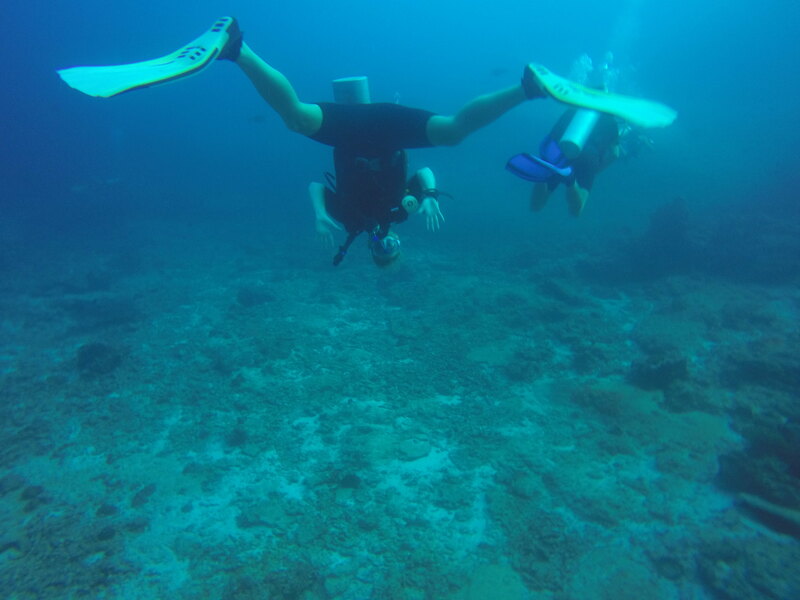 We did 4 dives our first day on the boat. That is A LOT. I prefer three, because you are pretty tired and worn out. 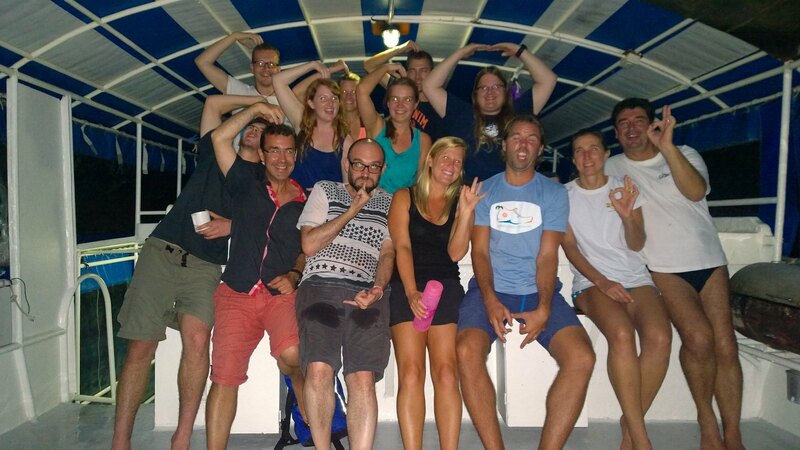 BUT, we were super excited for our 4th dive because it was our first night dive ever. Classic underwater selfie that you think is going to be cooler than it actually is. A glimpse of our dive computer. 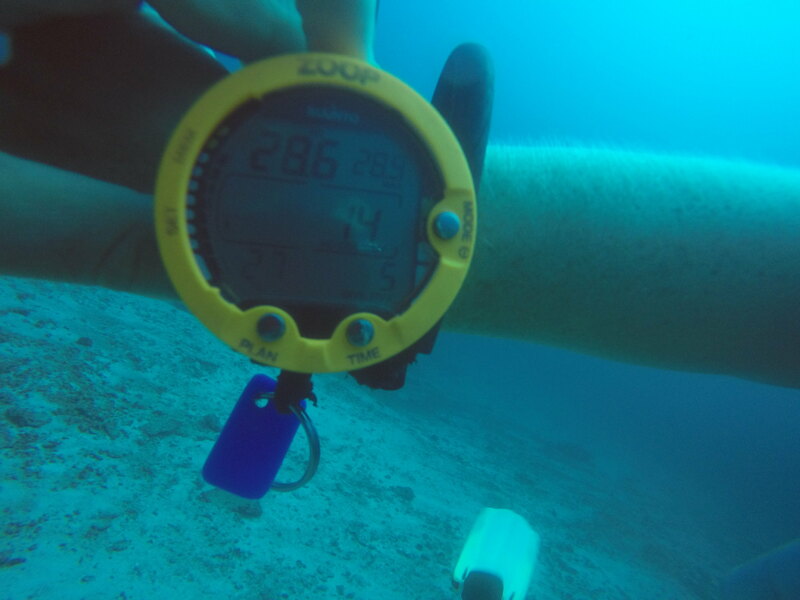 Tells you how deep you are, total dive time you can stay at that depth, how long you have been diving. The depth is in meters just under 29, which is 93 ft underwater! Weightless is the feeling when diving. Fun to flip upside down! Lot’s of different variety of fish species here. Also note the red filter enhancement from our purchase for the go pro. Helps to give you a true sense of the colors down below. 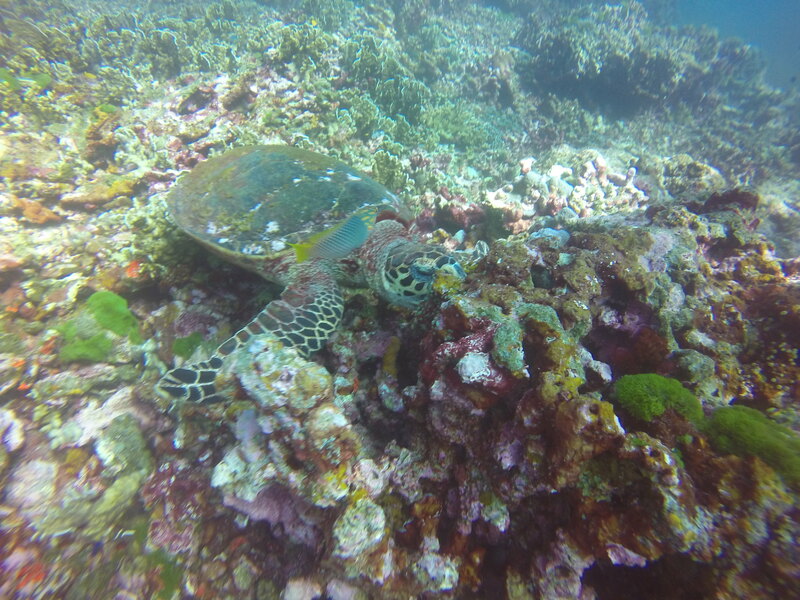 Hungry turtle munching on some coral. I will try to summarize (even though I feel I could write 5 pages…) and share with you some of our favorite memories. The people! We had a great group – 12 customers (this is a small group as the boat is full at 20 customers), 3 dive masters ( Lars was our guide and he was awesome. ), and the Thai crew (Captain, chefs, first mates, etc- I think 6 in total). The group is really what makes the trip. New friends from US, Germany, France, Switzerland, Sweden, and the UK. Group photo from our last night on the boat. We enjoyed a tasty bbq and some cold beers! 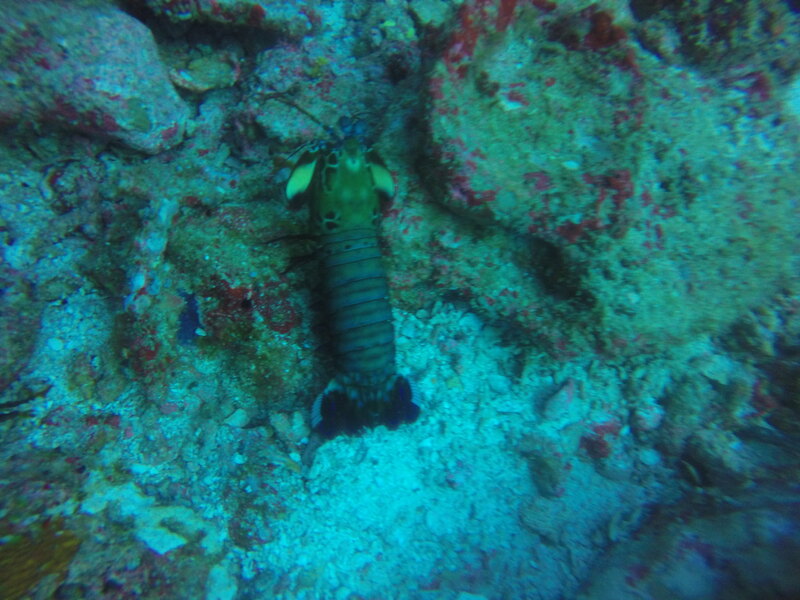 This is actually a picture of a mantis shrimp and what makes them special is they box their prey. Literally come up from their hole and punch them in the face. 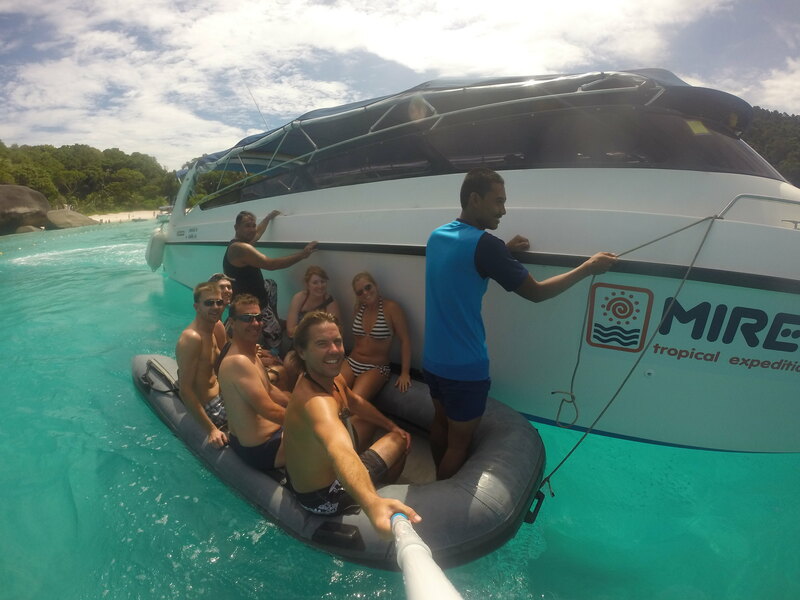 Our dingy engine failed after the captain dropped us off at Koh Similan island to enjoy the beach between dives. It made for a fun ride back when we hitched a ride and trailed along side a huge speed boat to take us back to our main boat. Happy campers getting a free tow back to our boat. At the end of each day we would gather on the top deck to socialize and relax before dinner. Somehow we got on the topic of accents (a product of a diverse group of people) so I asked the group, “what do Americans sound like” two people, not knowing each other’s answers described our accent as having a giant marshmallow in our mouth, and a mouth full of hot potatoes. Basically, we sound like big dumb rambling idiots. Haha, it was very very funny to hear their impressions. The night dive- what a unique experience. We plan to do another when we arrive in the Philippeans. No pictures from this but may try to take the camera when we do it again. A view of our boat from the surface. All shots are stunning! 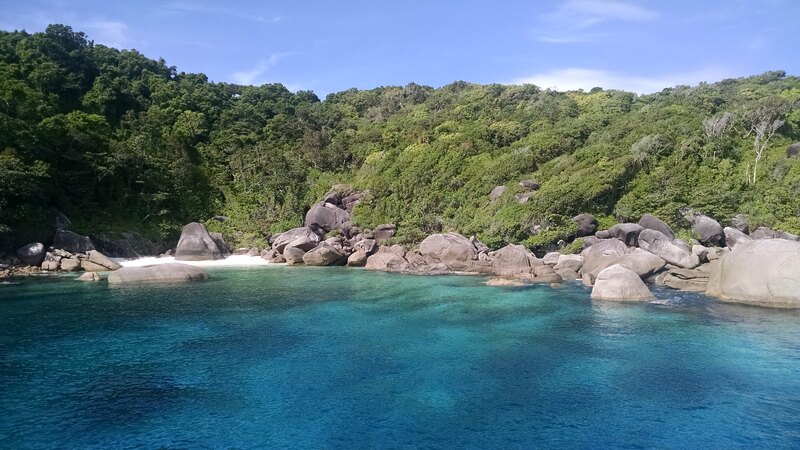 Similan Island is one of the best places for driving in summer holidays. I am crazy about water activities, so I will definitely plan to go there. Thanks for sharing this awesome experience. Very nice article about our 3 days diving in Similan. I feel a can live our moment again and again. Take care and have a nice trip. Hi Michel – what a fun trip, glad that we met. BTW, we used your guide in Camboodia – great recommendation, thanks for that. We will keep working on managing our air below the surface 😉 We’re diving the end of this week in Malapascua Philippines with thresher sharks, should be awesome. Take care and when your in Chicago let us know! Get blog updates via email.